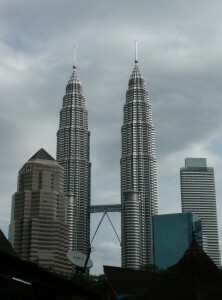 A day of sightseeing after a lie in but not a lot to see really in Kuala Lumpur. The one thing T wanted to do, the Petronus Towers, meant that we had to get up around 6 in the morning… never going to happen! Saw another china town, but these are 10 a penny nowadays! Went up to see the Bird Park – supposedly the largest aviary in the world. Actually really good & often you have birds flying around your lugholes. T even liked it as well. Only problem was that we spent so much time there that had no time left for the market… T wasn’t happy! Then caught the late plane to Singapore. T orn between the central market and the Bird Park, we decided to do the latter – I foolishly thought that I might still get time for a shop, but no. This is beginning to feel like a conspiracy… The park was actually really good though. 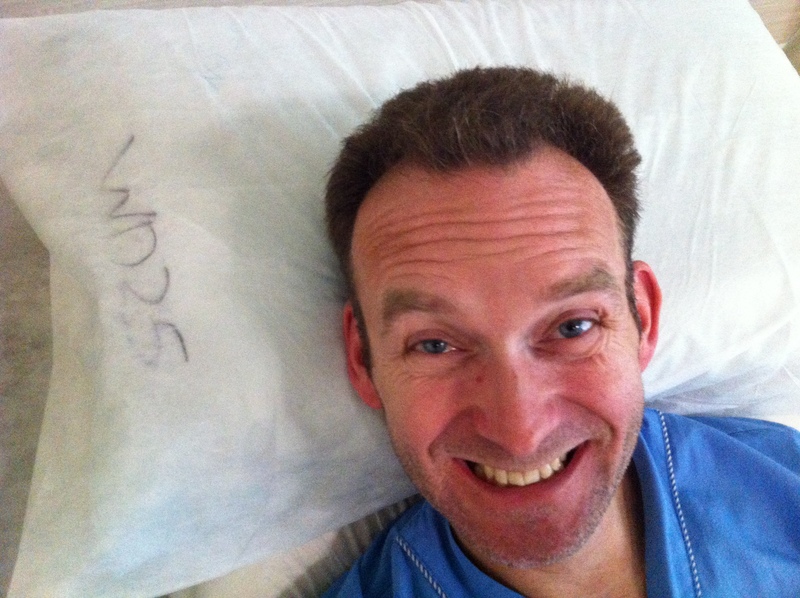 T convinces me, after another breathless episode, to get checked out in A&E… not that I needed a lot of convincing… & it was very efficient; I had an ECG within 10 mins of arriving… 3 hrs & about 3 ECG’s later, I no longer had any chest hair (Ouch!) & I was admitted for a proper diagnosis. The initial diagnosis matched T’s google one – Angina. Still, Singapore’s Changi ‘hotel’ was better than T’s place – had a large screen TV & my own ‘maids’! This pillow was obviously for a spurs fan…! The cardiologist admitted that she was surprised by the result, considering my fitness & age… yes, she actually thought that I was quite young to be experiencing this! I think T was just pleased that they’d found I had a heart after all! This resulted in an afternoon of having dye flooded around my system whilst under camera & then the cardiologist advised that they put a stent in when she showed me the 80% blocked artery… all over in 20 mins whilst under local anaesthetic… the wonders of modern science! Popped up to see Keir after breakfast, well, I guess it was actually lunchtime :-), to find he had been whisked off for a test and that they wanted to do an Angiogram to find out where the blockage was – Keir was adamant they do nothing unless they had to; they were threatening no flying for 6 weeks if they had to intervene, and our flight home is in 2! Poor old T hustled over to spring me out of hospital & then they made us wait ages whilst they sorted the paperwork… got to say she has been an angel; think I may have to call her ‘Saint Tracey’ now! 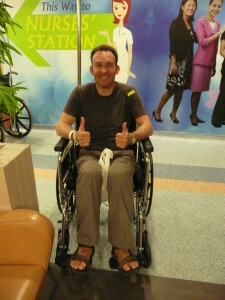 The staff at Changi hospital were great & facilities fantastic – can’t say enough good things about them both. A gentle day in Singapore with T treating me like paper then the night safari! When we got there it felt completely touristy but it turned out to be absolutely excellent. We started on their tour bus & then wandered around ourselves. The animals seemed not to be bothered by people at all, & we saw a lot of them that would have been hidden away in daylight. 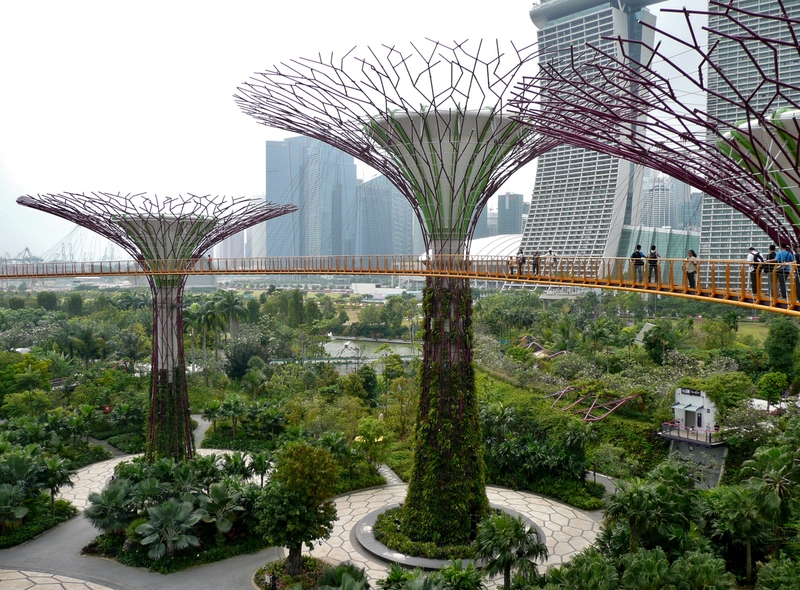 Spent the day wandering around the Gardens by the bay – lots of different types of gardens & sculptures… T even got me up high on an aerial walkway… that was good for my heart! Then back to another overnight bus; this time to Penang. 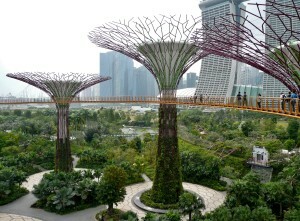 Gardens by the Bay was a bit like the Eden project inside, but with some high-walkway connected Super Trees outside, which generated the power and collected water for the gardens. Nice views. 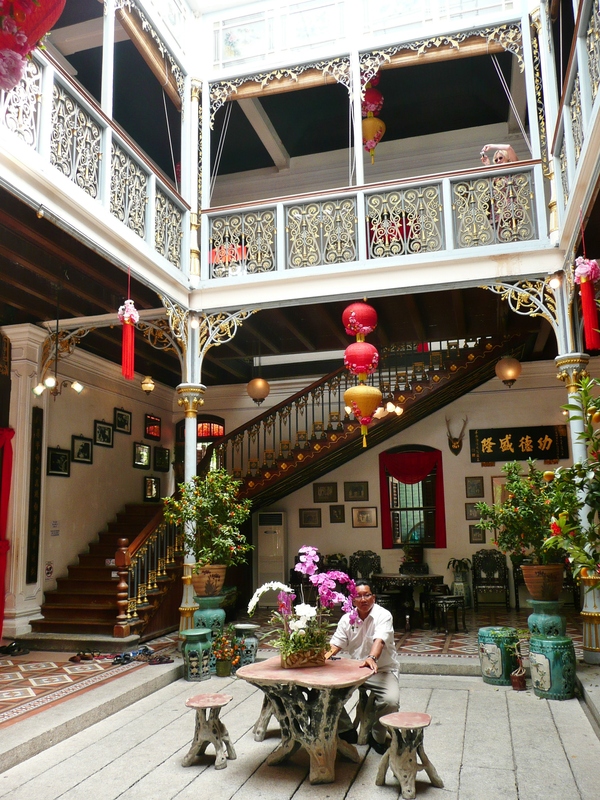 Booked into our very nice hostel where the owner had previously had a similar issue to me & been fitted with stents. 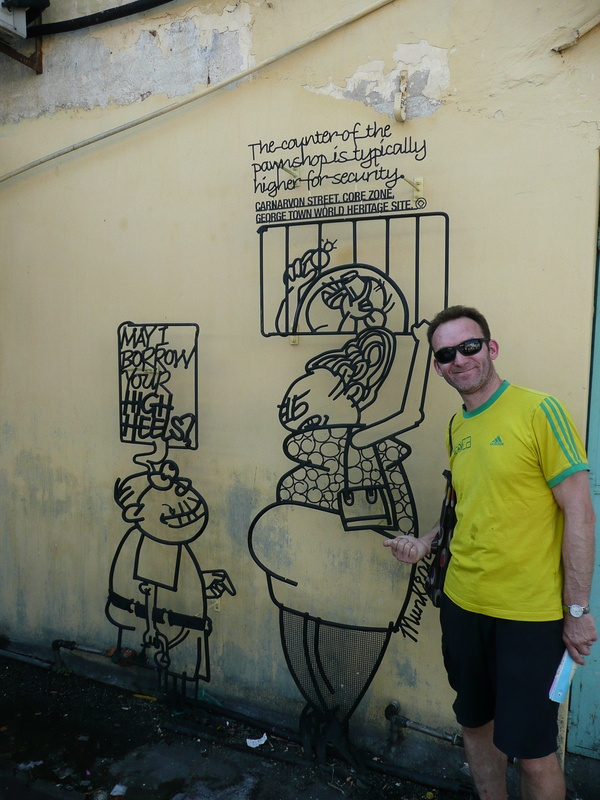 Then a day spent doing a walking tour of Penang – cool graffiti & wrought iron signs, Cheong Fatt Tze’s mansion, Fort Cornwallis, Khoo Khongsi clan house, temples, mosques & churches. Highlights were the graffiti, Cheong Fatt Tze’s mansion (the Chinese Rockefeller!) & the stone carvings in the clan house. Went out to the cinema in the evening – nice to see an English film again. 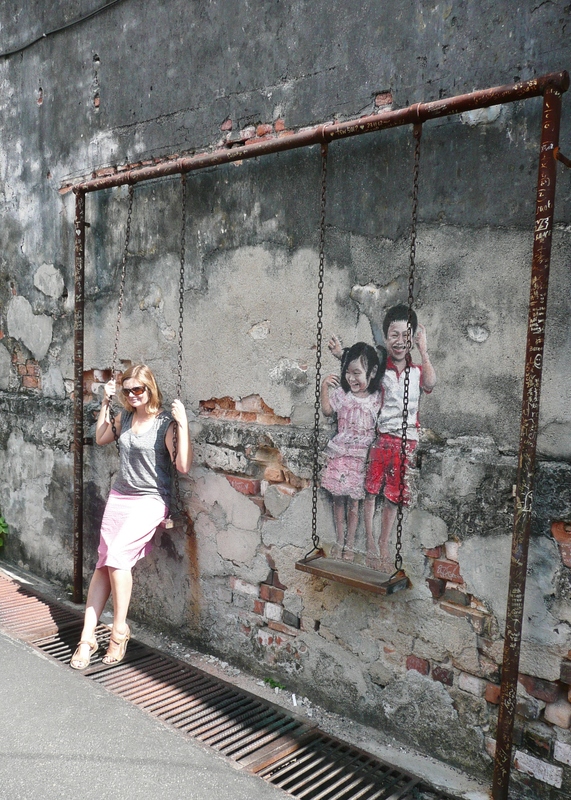 Had a lovely day today, the Cheong Fatt Tze Mansion was beautiful, Khongsi clanhouse too, not quite so sure about the fort personally, but Keir seemed to like it, and we managed a bit of a street art tour – just to make us feel like we were home :-). The hotel is great, and the owner/ manager seems to have bonded with us over the near-cardiac arrest experience. Plus we had the BEST, if possibly most expensive, breakfast for some time! A day spent doing tax & travel insurance paperwork then tootling around the town. Yuck, tax. Why do I always leave it until the last minute? 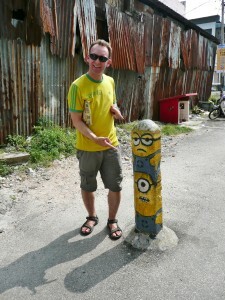 Took the bus to Batu Ferringhi & wandered along the beach. Not as nice as some places we’ve stayed (hostel only had cold water!! & place was a bit touristy) but great that T had booked us in for some sea time here instead of Langkawi. T managed to find a good place for dinner & then we found a lovely bar on the beach for a nightcap with some Swedish friends we met. The 90-odd percent rated hostel was clearly more aimed at much younger, skinter people than us, or possibly musicians as the guy seemed to have a full studio there. Sadly the rest of the facilities were somewhat lacking. The bed was way too soft, but I have to say that the owner giving me his mattress as a replacement was probably beyond the call of duty! Keir was in a foul mood about the cold water shower, which it WOULD have been nice to know about, but at least it is hot outside. 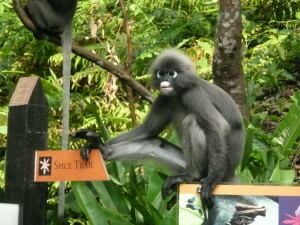 A day out in Batu Feringhi; visited the Butterfly gardens & the Spice gardens where we saw some Minkeys running around. 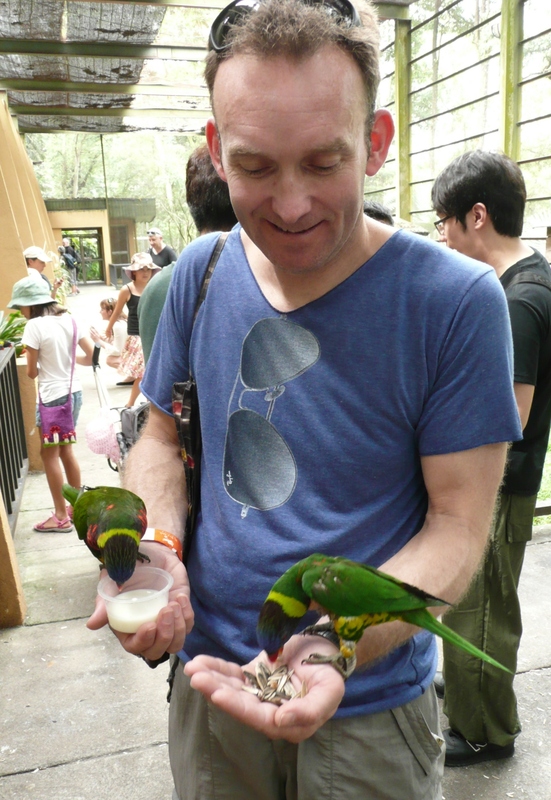 T was keen to take them home – v cute. 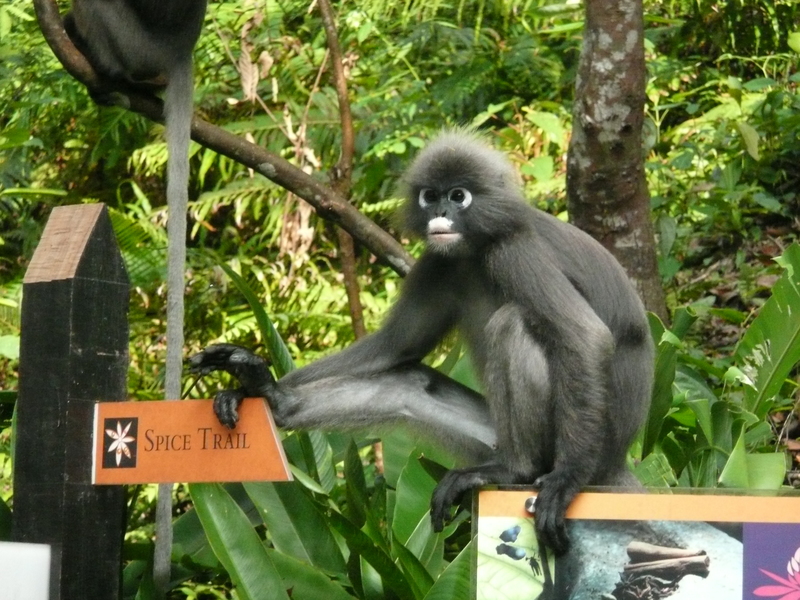 Liked the Spice garden so much that we came back for dinner that night on a platform overlooking the sea – magical! The butterfly gardens were great (and I didn’t get freaked out, fortunately), lots of beautiful (and not too large) specimens fluttering around us, but the gibbons at the Spice Garden were undoubtedly the highlight – weird white eye sockets with black eyes made them look oddly like the toy animals with moving eyes that I remember from childhood; cute. The cocktails and food at the Spice Garden were phenomenal, if you are in the area, you should definitely go! Took the bus back to Penang, stored our bags at our old hostel & then saw the clan jetty & murals, followed by a trip up Penang hill for the beautiful views & walk back through the woods in the dark. 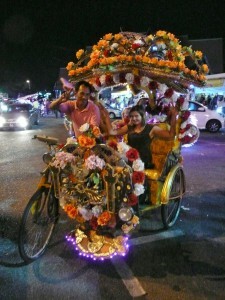 Then back into town for the late bus overnight to Melaka. 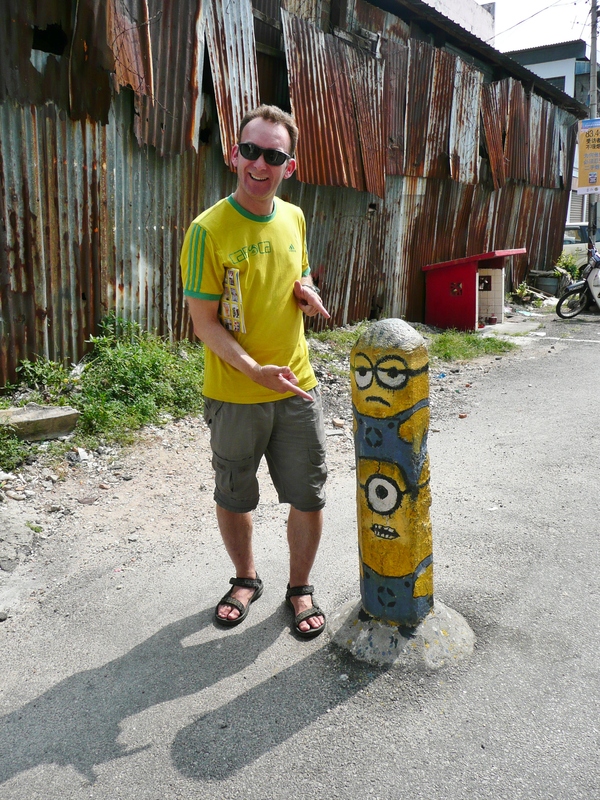 A last ditch attempt to see the rest of the street art, including a high proportion of minions(! ), and trying to find somewhere that I could eat that was actually open for dinner – Chinese clearly out as most of them are on extended holiday for Chinese New Year – we had to settle on Italian in the end and I unfortunately got the cream dish; urgh, why do they never tell you when the whole dish is going to be covered in cream? Then off to Melaka on the rather late midnight bus! Arrived in Melaka to find we’d booked a motel a wee distance from the town by mistake; however, the upside was that we had the biggest room this side of Christendom! 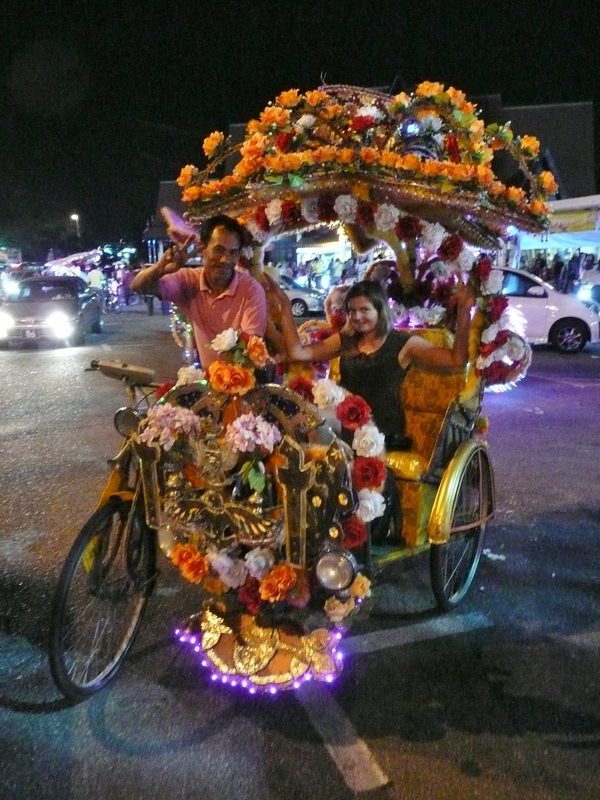 Excitingly (for Tracey), there was a night market , My what fun we had wandering around that! They even had one of these huge viewing platforms that looked a flying saucer – you strapped yourself in with about 40 others & then were winched to the top of the tower before gently descending. Oops, I was clearly a bit worn when reorganising the last 2 weeks as I somehow forgot to check the location of the hotel. Beautiful room, but a complete pain having to get taxis every time we wanted to go anywhere, including for breakfast :-(. Not surprisingly T took a dim view of this & told them so in very loud tones that soon had had the whole restaurant looking on… woe betide anyone that tries to get between T & her breakfast! So, don’t bother with the Dutch Harbour café… they’re officially crap! 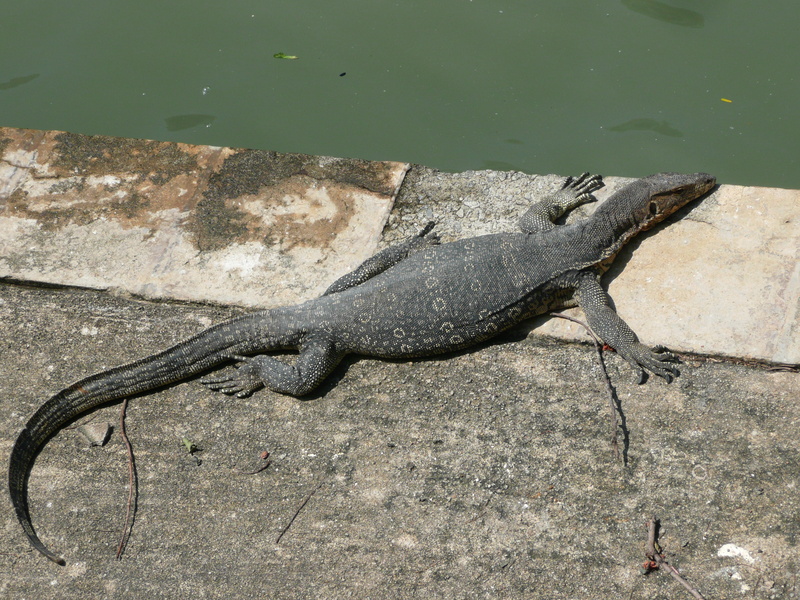 We pottered around town & we did see this amazingly huge monitor lizard sunning itself on the banks of the river – it wasn’t bothered by anything. Another evening at the cinema – there won’t be much left to see when we get back! Possibly the most useless service ever. I simply could not believe that a restaurant would wait 15 minutes AFTER TAKING your order and then come back to tell you the chef was now busy, but you could order something off the lunch menu. It says ALL DAY BREAKFAST and that is WHY we came into this restaurant in the first place!!!! Tossers. In fact that word is definitely NOT strong enough. Boycott them and try the place across the river where they actually know what ‘all day’ means. We took the bus to Singapore back a day early so that we could be back in time for my hospital appointment on the Monday. An afternoon spent shopping… do they have a lot of malls in Singapore or what? T was like a woman possessed! Went for the Hospital appointment & got the all clear then some shopping for the delayed Xmas. 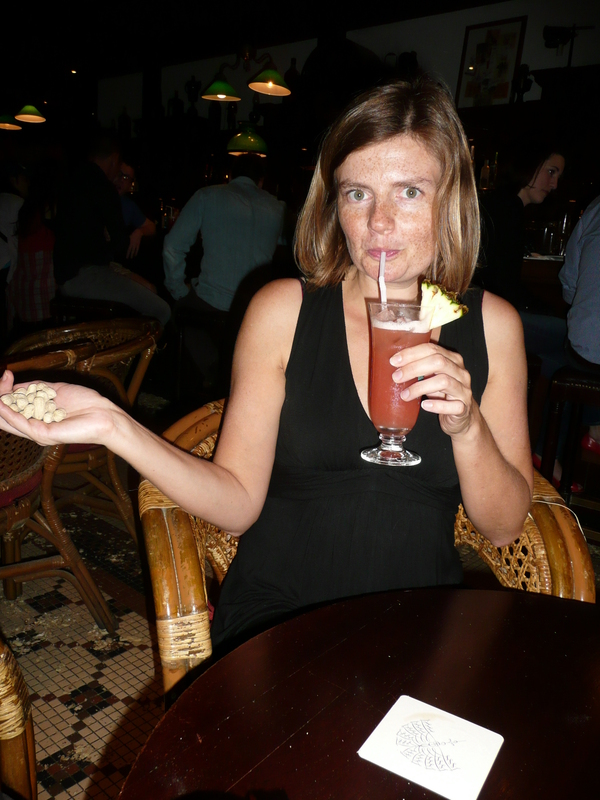 We popped into Raffles for the famous Sling… but it was a disappointment to be honest. The bar is a reconstruction of the famous Long bar. Still, ticked it off in the ‘book’! Despite the hospitals assertion that the appointments were usually pretty much on time, they were about 30 minutes late, and annoyingly I had just finished my book causing Keir to have to deal with a bored me prior to seeing the doctor. Never mind, at least we are all clear to fly home! Went to Sentosa Island & had a fun time on the Segways… another way around the world! Very happy to have got this one in as we’d been on about it for the last year! The Chinese New Year celebrations were moving apace & we came across a Chinese dragon blessing all the shops – quite a big job in a place like Singapore! Headed off to the airport for the flight home where we saw a fantastic light installation. 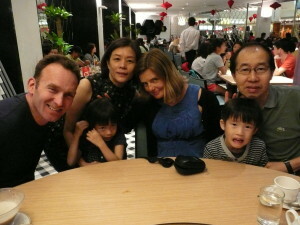 By now I’m very excited & looking forward to heading home – a year’s a long time. But I think T could have happily carried on for ever! It seemed surprisingly anti-intuitive manoeuvring the Segway, but I reckon that I just need to get used to it :-), fun though, I might have another go sometime! Then a quick Lebanese and off to the airport – unfortunately our last minute change of flight meant we had to fly on Finnair, an airline that seemed to be roughly equivalent to American Airlines with a movie screen smaller than the screen on my phone. It was meant to be Cathay Pacific too, but hey ho, we had to take the only re-route we could get! 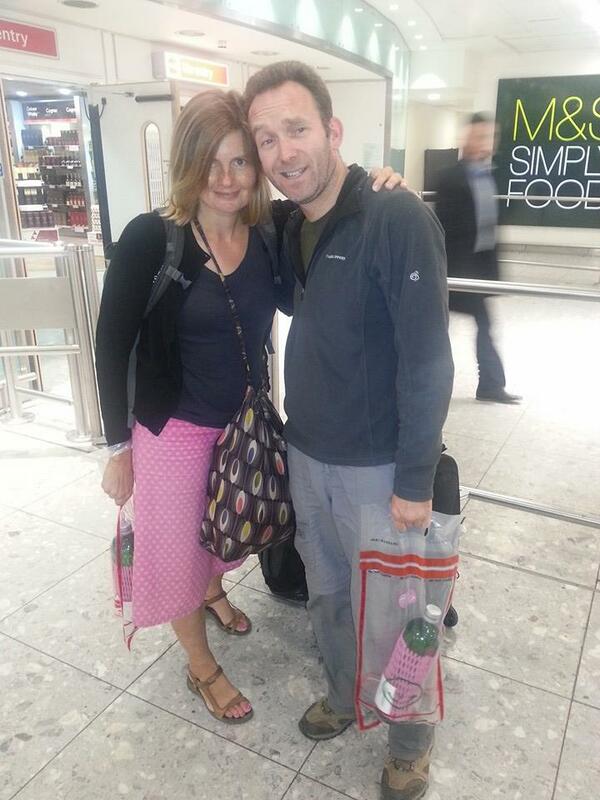 My Mum & Dad picked us up from the airport & back to theirs for toast & marmite – the taste of Britain! Here endeth the blog – 363 days (don’t ask me what happened to the missing two days) of chat, reminisces & general tittle tattle. If I have any Advice for someone doing a trip like this… don’t write the blog daily!! !